I've decided my summer trip this year will be an alpine adventure from France to Austria. The Alps include some of the most remote roads in Europe, with limited mobile phone coverage in parts. I will be scouring the maps for some of the lesser-travelled roads, many of which are either gravel or derelict remains of what used to be tarmac. For my own safety and peace of mind I took advantage of the after-Christmas sales and bought myself a SPOT Connect for £129. This little box (not much bigger than a deck of cards) serves several purposes, the most important of which is the SOS button that communicates via satellite to transmit the user’s current GPS coordinates and send for help (police and/or search and rescue as required). 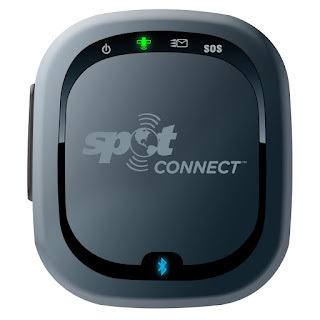 As the name may imply, the SPOT Connect also connects to a smartphone via Bluetooth which enables features such as realtime tracking to a public or private Google map, predefined check-in messages to friends/family and satellite-based text messaging. The services require an annual subscription at €99 for the basic SOS service plus €39 for tracking. A little bit pricey, but a good insurance policy should the worst happen while away from civilisation—anything from engine failure to a broken leg. Not a lot of Europe is without mobile phone coverage but Sod’s law says you’ll need it when you don’t have it. And coverage is virtually worldwide should I get a sudden urge to head off to Australia via Dubai. Once it stops snowing and generally being cold and miserable outside of London I’ll give the tracking a go, but I suspect it will quietly go about its business in the background without fuss. The SPOT Connect is well-built and finished with a soft-touch plastic coating and seems sturdy enough to survive a bigger crash than my body would so it’s comforting to know that help can be summoned anywhere I can see the sky. During my trip I experienced numerous connectivity issues and annoyances with the SPOT. Due to the lack of buttons on the unit (only power and SOS), a smartphone app is required to start the tracking function (and access most of the other features of the unit). About 50% of the time the SPOT and my phone refused to see each other despite using a Bluetooth connection—my GPS and headset also use Bluetooth and had no issues connecting to my phone. Also, once tracking commences, the user needs to remember to briefly press the power button every hour or the unit stops tracking... why??? The real deal breaker, however, is SPOT’s requirement for batteries—specifically AA Energizer Ultimate Lithium 8x batteries (L91). The original set lasted about 16 hours in total, despite SPOT’s claims that they would last 4.5–6 days when tracking. These batteries proved impossible to source in continental Europe and I wasted a couple of hours one day trying electronics shops and larger supermarkets with no luck. I had several Sanyo Eneloop rechargeable batteries for my camera flash and tried them, thinking they might work, but need to be recharged often—but the unit wouldn’t even switch on with these. Why a device like this can’t have a built-in battery with universal USB charging is beyond me—so 2 days’ tracking cost me £129 plus €138 subscription. What a bloody waste. For these reasons, the unit is useless to me. If you want to buy it at a heavy discount, please get in touch—it is like brand new still.